Greetings friends. It’s been a while since I was last here. Adulting responsibilities have been a lot and I have missed sharing my rug journeys with you all. I am getting back to staying in touch and hope to do so consistently. I will be doing a series of blog posts on the rug making process with some videos on our YouTube channel. My hope is to have you walk alongside me as I share my passion for rugs. The beautiful rugs you see in homes and on display in quality rug shops are of course the finished product. What the end user doesn’t usually understand is just how much work goes into creating a quality handmade carpet. So, to start off our series, I thought I would start by explaining the conception process of these beautiful pieces of art – the mapping process. Before any wool gets dyed, before any weaving gets done, we must, of course, determine what rug we are going to make! 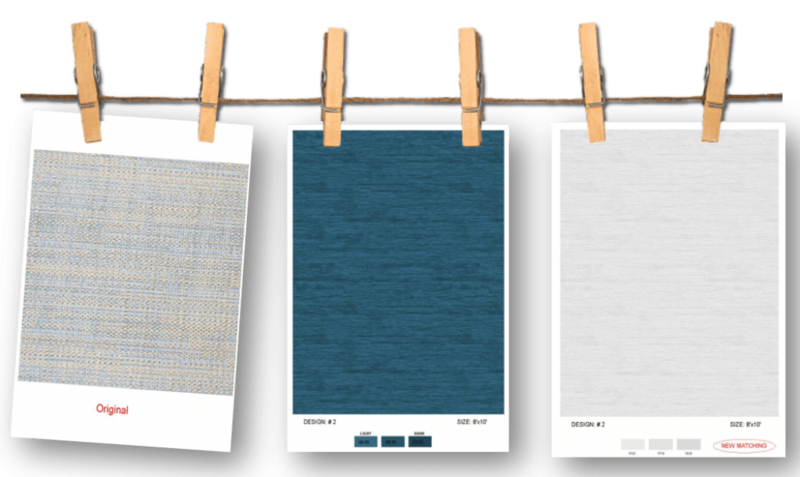 In that, the designer envisions the rug, determines its make, colors, style, and size. These days I do most of the design work in collaboration with my mom and dad. The images below show an example of a design we created. On the left you can see the design inspiration, which was a fabric swatch. On the right you can see the finished CAD/map of the design in two colorways, 8×10 scale. The CAD/map is created through a rug software program. In the final CAD/map there is literally one pixel for every individual knot. In the video below is an example of a custom carpet that is 11’6’’ x 26’0’’ and has 5.2 million knots! Every one of those knots is a single pixel inside the CAD. There is an incredible amount of responsibility placed on the CAD/map designer to make sure that every single knot is correct. 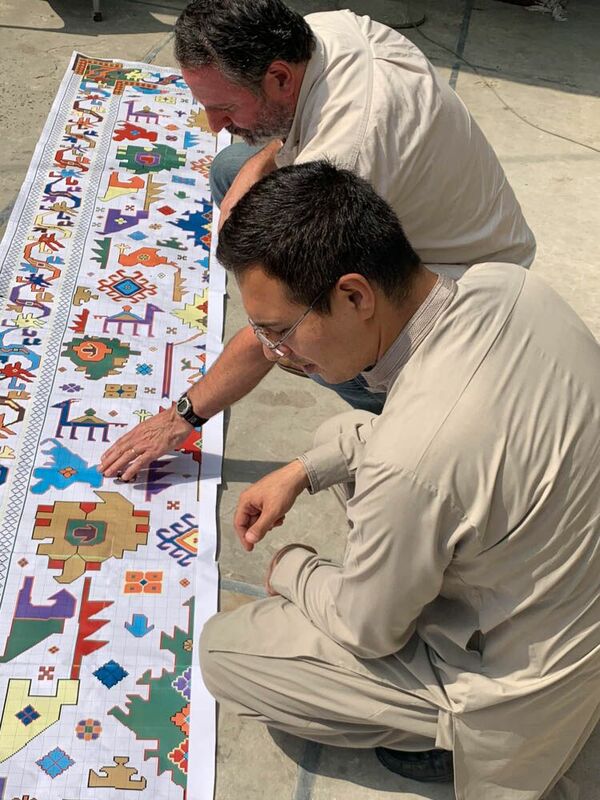 Just making the CAD/map for a large hand knotted custom carpet (with an unusual repeat), can take anywhere from 20 to 25 days, sometimes even more – depending on the type of design. 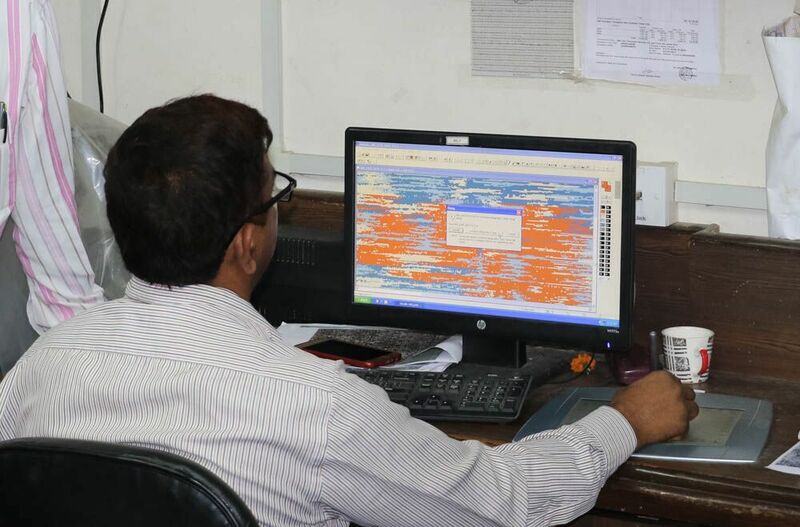 Once the map is done, it is then printed and analyzed for screen-to-paper consistency. The amount of work that goes into the mapping process is significant, but necessary in order to create a beautiful carpet. Quality materials such as wool and silk are expensive and we need to make sure that every carpet we make is worth the investment. Well, friends, that sums up that. In the next post we will look at some wool dyeing!